Favourite Artwork Chosen by AGO visitors! From November – February 2015, the AGO asked their visitors to vote for their favourite artwork in the AGO’s collection. Wisdom of the Universe was voted #1. 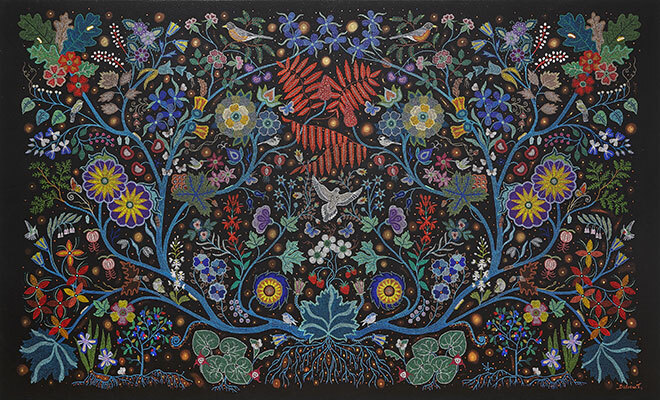 To see the full list of the top 10, please visit the Art Gallery of Ontario’s website. “In Ontario, over 200 species of plants and animals are listed as threatened, endangered or extinct. Of those, included in this painting are the Dwarf Lake Iris, the Eastern Prairie Fringed Orchid, the Karner Blue butterfly, the West Virginia White butterfly, the Spring Blue-eyed Mary, the Cerulean Warbler and Acadian Flycatcher.